This week, my book Please Ignore Vera Dietz came out. It’s a pretty exciting time, but what's more exciting is that I get to gallivant around to interesting blogs and deliver some brain pizza to cool people. (Official Rules here, if you’re the curious type.) Booking Mama and I share an awesome local independent bookstore, Aaron's Books, so I've had the pleasure of meeting her on a few occasions. Earlier this week, she reviewed Please Ignore Vera Dietz here on the blog and I was just so so happy that she liked the book because her blog is one of my favorites! Booking Mama: In PLEASE IGNORE VERA DIETZ, I recognized a city that looked an awful lot like Reading, PA. (I only knew that because my husband grew up there.) There were a few similarities, but the most telling was the appearance of the Pagoda, a red brick and tile pagoda built in the style of a battle castle of the Shogun Dynasty of Japan, that stands above the city I have to say that I loved how you incorporated the Pagoda into the story -- it really became a character is its own right. 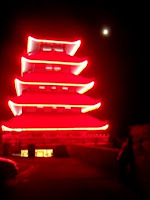 The pagoda was not only as a place where some major scenes occurred, but it also served as an important symbol in this novel. Did you always plan on the Pagoda being such a major part of the story? And, at what point did you decide to give the Pagoda its own voice? ASK: I'm so glad the pagoda worked for you. Because you're a local (or an honorary local) this means a lot to me. At first the pagoda was just a setting, and during Vera's time there, it naturally grew into a symbol for how out of place Vera feels in her life, in her town, in her family. I mean--a pagoda. In the middle of Pennsylvania. Most readers are not going to believe that can exist, right? It's just so out of place. 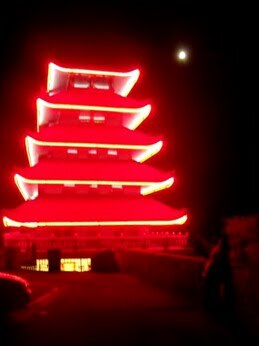 I admit, when I first realized that the pagoda was becoming a large part of the setting, I was concerned because I didn't want anyone to think the story was true or that Mt. Pitts was really suburban Reading, PA, where I grew up. There are certain similarities, yes, but Mt. Pitts is fictional. It just happens to have the exact same pagoda. Then, one day as I was writing, the pagoda started to talk. I wasn't too shocked. This happens a lot with me as I'm writing. My books usually have more than one point of view, and sometimes those of dogs or dead people or even insects. But in this case, since Vera was exploring Zen and animism, I felt it was a perfect time give a large inanimate object a speaking part. What better object than the pagoda who witnesses what Vera and Charlie are up to? 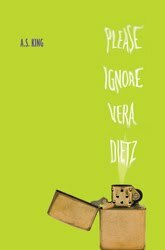 Booking Mama: You already know that I think you are a fantastic writer, but I think you did something very special in PLEASE IGNORE VERA DIETZ! I just loved how you created Vera's character and told her story in her own words. And, I also really appreciated how the story unfolded -- you successfully went back and forth between the present and the past in alternating chapters and gave just enough information to keep the reader turning the pages. One thing that I felt added another dimension to Vera's story were the occasional chapters that weren't written in Vera's voice. I thought you had a lot going on this novel, and it just begs some questions about your writing process. So, I'm very curious about "how" you wrote this novel. Did you know the entire story when you started writing? In what order did you write the story? When did you decide to give the other characters' voices? Did you always know that you were going to give each chapter a special title? ASK: When I start a novel, I have no idea where it's going, usually. That was certainly the case with Please Ignore Vera Dietz. I knew about Vera and Charlie. I knew Vera was delivering pizzas full time during her senior year. I knew she was conflicted and devastated by Charlie's death and by what had unfolded before it. I didn't know anything else when I sat down to write. I didn't even know Charlie's big secret until page 50 or so--when the reader becomes suspicious, too. From what I remember, the two main storylines, Vera Present and Vera/Charlie Past unfolded at the same time. Then, in between, Ken Dietz started talking and making flow charts. The Dead Kid pretty much showed up in place, too. And like I said, the pagoda just started talking one day. The chapter names just seemed to go along with the voices. Of course, it didn't come out in the exact same order it's in today. Close, but not completely. After the first few drafts, I do a lot of rearranging and making sure parts are balanced. I will even admit that I mathematically balance everything at first (spot the weirdo) and then from there, I lop off chapters or shift POVs based on my gut, even if it freaks out the math geek in me. Booking Mama: I think you are such an interesting (and very cool) person, and I am in awe of how your mind works! That brings me to my next question... What is your favorite thing to do when you're not writing and why? This is really my pool. Isn't it pretty? ASK: (Aw. *blush* I think you're cool too.) I have two young kids. The youngest is only three, so I have my hands kinda full there when it comes to free time. But I love to swim. Lucky for me, both my kids are fish and my husband and I help run our local community swimming pool. Why? 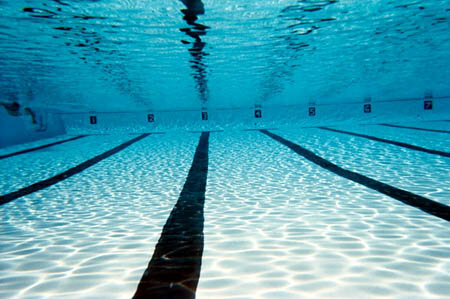 I've always loved to swim, and after twelve years in Ireland, where outdoor pools don't really exist all that much (or the weather to use them) I really really appreciate being able to swim laps outside everyday in summer. I used to be an addict--a lap counter. But this year I've slowed down some and am enjoying the water. Its coolness. The colors. Playing with the kids. Extra Cheese Bonus Question -- Booking Mama: You already have two fantastic novels under your belt. What is next for A.S. King? Can you give any hints about what you are currently working on? ASK: I'm in the middle of editing my next novel, EVERYBODY SEES THE ANTS, which will come from Little, Brown in Fall 2011. It's a book about a 15-year-old bullied kid who mysteriously communicates with his POW/MIA grandfather in order to sort out a bunch of things that are wrong with his life. I'm really excited about it because I think it's another different book--the way The Dust of 100 Dogs and Please Ignore Vera Dietz are different from each other. This one is me all over again, but nothing like the other two. I'm also working on a first draft of the next YA novel. I'm only about 30k into it, and so far it's shaping up to be another strange book. But I have no idea what it's really about yet. I hope to sit down and really figure that out over the winter. Julie, these were such awesome questions! Thank you so much for making an order and being part of the Pizza Delivery Blog Tour. I hope you enjoyed your pizza! I AM SO EXCITED ABOUT MY OFFICIAL LAUNCH PARTY TOMORROW!!! Aaron's Books, Lititz, PA, October 16th, 6pm. The party is free and open to the public, but reservations are required. RSVP 717-627-1990 or email sales@aaronsbooksonline.com and come help us launch Vera into the world! Oh my gosh, how I wish I could come to that launch party! This book sounds amazing and I'm in awe of how Ms. King's mind works as well!! Great interview! Amy is right, these are awesome questions and I just loved this interview. And I just love the book. Sometimes "different" is a veiled insult but when used for ASK's books is a huge compliment. I just loved this interview and that pagoda is sooo cool.